Jared joined Hansen House Company in early 2017. After graduating from the University of North Dakota in 2008, he began his public accounting career in Bend, Oregon, working largely with individual and small business tax returns. 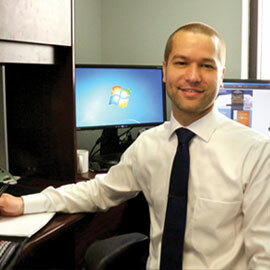 Upon moving to Duluth in 2011, Jared earned his CPA before joining Wipfli LLP as an auditor. After joining HHCO, he has enjoyed shifting his focus back toward small business and individual taxation as well as branching into estate and trust returns. Jared is a member of the Minnesota Society of Certified Public Accountants (MNCPA) and serves on the Finance Committee for the Boys and Girls Clubs of the Northland. When he’s not in the office, Jared enjoys spending time outdoors with his wife (Erin) and dog (Drifter), travelling to remote parts of the world, and renovating his residential properties.